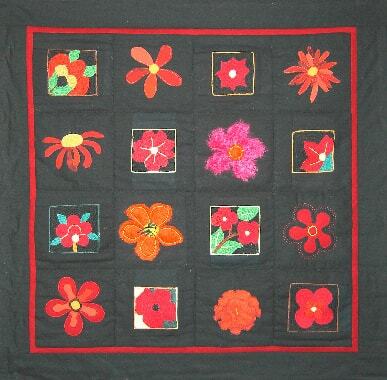 With my black and red flower quilt made from Afghan embroidered squares I wanted to stick to the typical square shape, so I made eight additional flower squares myself and combined them all in one large square. The border replicates the narrow stitched border of each single square, thus repeating a pattern that is already there. The black border is intended to be a calming conclusion of the piece. 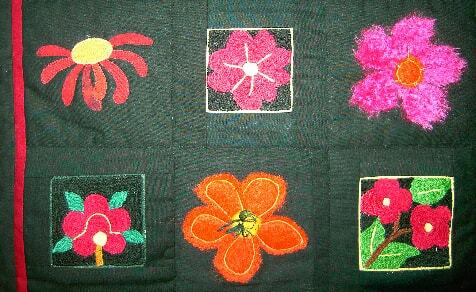 By spring 2006 there were around 50 ‘official’ embroiderers. They could make as many squares as they wanted, and we purchased all of them regardless of quality. On my second journey in spring 2006 I introduced a quota of between 10 and 80 squares per embroiderer depending on their skill and technique with a guarantee that the agreed-upon amount would be purchased, in order to achieve a balance between what they can produce and what can be sold in Europe. After my second journey there were already 167 embroiderers with a total output of approximately 3.500 squares every three months. By spring 2006 here were some “official” 50 embroiderers. They were allowed to do as many squares as they wanted, and all of them were acquired, even if the quality was not perfect. On my second journey in spring 2006 I started a system to regulate how many pieces they can do (between 10 and 80), depending on the embroiderer’s skill and technique. And I guarantee to boy what they produce. The point is to find a balance between what they can produce and what can be sold in Europe. After my second journey, there were already 167 embroiderers, who did about 3,500 squares quarterly.